Today I am sharing an unpacking update, as it is going much slower than I expected, in large part because our heat wave continues, and is scheduled for another week. As I am determined not to be made sick or injured by this move, I have been respectful of how much unpacking I can do while sweat is literally dripping in my eyes and running down my neck. Although this house has a bit of air cooling it is not sufficient to cope with this heat - I have put a major upgrade to full on air conditioning on my list as soon as the cash flow will allow it. In that photo above, besides my ever present helpers Butch and Sundance, who will be a year at the end of August, (Sundance is on the cutting table to the left, just out of view) you can see where I will sew. To the left will be one cutting table and to the right, once all that stuff is properly put away, will be my other cutting table. To the far right are doors to a reasonable size closet. My thread is in that white - still taped up - rolling cart to the far right, and my 8 scrap bins are there with the boxes of "cutting table shelf" bits. Here is a photo standing at the sewing machine. You can see the overall size of the room and to the very far left there is a small bathroom too - so I have my own loo and water for my iron at hand. The shelves are all from IKEA. The fan is due to the heat wave. The long arm sewing machine will go about where the fan is, right down the middle of the room for easy access on all sides. 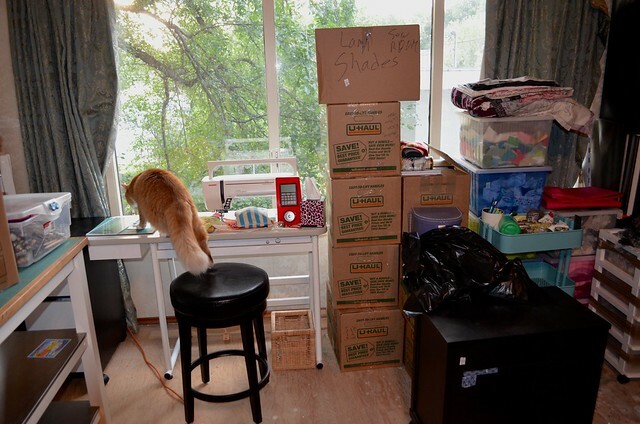 The boxes to the left will all be unpacked and they are mainly other craft things, and my family photo project. The photos will go in the closet to the left of the sewing machine and the craft stuff will go elsewhere, but needs to be unpacked before the long arm can be set up, which I am keen to get done. It's going to be a great studio. Yes, the floor is unfinished as I had the awful rug tossed out, and I have not decided on flooring yet. And yes, that means that one day I will have a floor guy here putting in one side and then the other side of the floor while things are moved about, but oh well, for now I am good with the industrial look. Here is a closer view of the fabric. There is another box with more solids somewhere and there is one more 12" cube box of Tula Pink collections but I am pretty sure that will be all of it. Yesterday I was able to add most of my collections to the rainbow shelves and I am hoping to just do that with the TP box and those bits on the open shelf today. The thing is that I don't use the collections because they are "special" and when I was packing them I realized that I probably won't use them if I don't put those fabrics with the rest. So I am going to hold my breath and sort in the rest later today, or if not tomorrow, whenever I can manage it. I don't apologize for my fabric stash or even for its size. I do appreciate that I will be able to sew for years before this is all gone and I will be sending some ot it to others for a charity project. And this move has been very good in helping me to understand that this is about the right amount of fabric for me to have on hand. For me, the fabrics and the colours are a bit like my paints - I need a sufficient supply on hand to allow me to work right now on whatever comes to mind. I do point out that I fold anything that is a foldable size and put it in these shelves, my scrap bins are generally reasonably small pieces only. So much of what you see are cut into fat quarters that others might have relegated to the scrap bins already. Anyway, I sure hope to be sewing later today - I have yet to find my iron and I am going to buy another while out on errands today as I have decided a spare is not bad and I can wait no longer to get back to the sewing. The rest of house is not fully unpacked yet either. Over the weekend we decided on the location of 6 bookshelves, including these three. We love real books, and have many. The books are a quick, although tiring unpack and starting that is on the list too for today. I hope to be able to show you fully unpacked rooms next Monday - wish me luck. Here is the view from my kitchen sink. We have several healthy Elm trees in the yard, you are seeing one of them. I need to learn the rules about keeping them safe from Dutch Elm Disease. 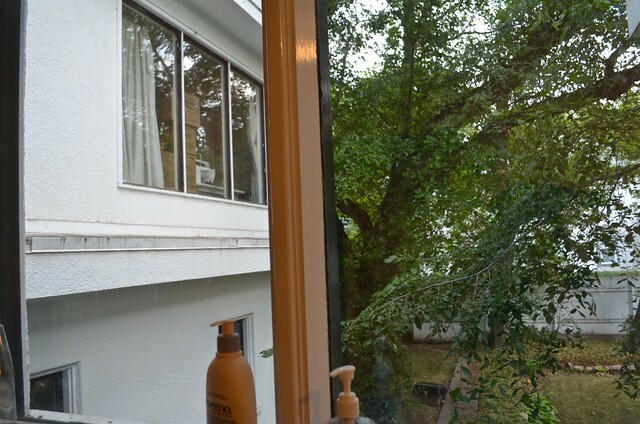 Also to the left, that is my sewing machine in the window, that room is over the garage, which is why it is so large. Well, my morning is for my day job, and then to the unpacking. I am also going to take pity on the yard and pull out the sprinkler today. I'll see you tomorrow for the August Scraptastic Tuesday link up and I will be back in this space now regularly I think. It's always exhausting to move, but sort of an adventure too as you get to revisit everything you own/didn't know you owned/might not want to own anymore. :) Your fabric shelves look wonderful. I agree that it's wonderful to have just enough on hand to move through a project. I think getting in the habit of running off to the store or having to wait on a fabric to arrive in the mail stifles creativity much more than people realize. Good luck working on the rest of the unpacking at a healthy rate in the heat! I only have small bits in my scrap bins as well; FQs and even used FQs stay in the stash. I am also looking at all the bright yellow suns with very little clouds for this coming week of weather. Its gonna be hot. But that might also describe your very cool studio. Luv it. There probably is something about too much fabric but yours is wonderfully attractive and moderate. It does take time to figure what we need and then we get to pass on to others what we didn't need and just had the pleasure of patting and folding. Then when we are in 'the zone' we have all the necessary options. As you are unpacking you can anticipate wonderful times of sewing in the future!!! :) Turn the fans on high enough for cooling but not enough to get things fluttering! I have some Ikea in my sewing room as well. When I went to buy more I got extremely frustrated by the potential hauling assembling. My husband was out of town and I decided it was just too much effort. So--I went to a hardware store, bought some snap together shelving (which holds up to 75 lb a shelf) and put a couple of units together in 15 minutes at a cost of $16.95 for the small and $29.99 for the large. Done! It's black plastic, doesn't smell and will do the trick until I decide to do something more furniture like. My fabric storage is in another small closet. 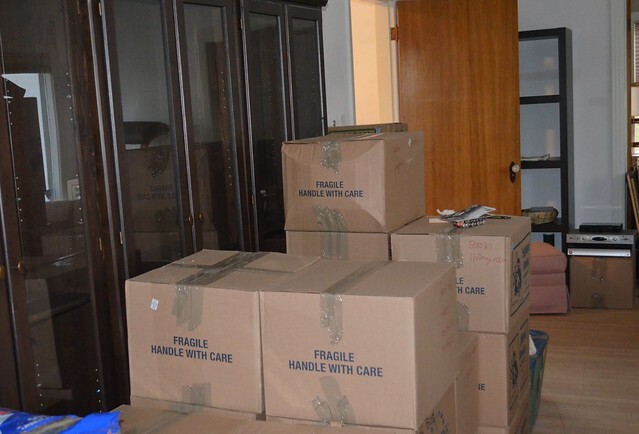 Good luck to you with continuing to unpack and make your new house your home. Don't push it too much - there's no reason to rush! Unpacking indoors in heat must make it all the more tiring. Good luck! What you've got so far is looking wonderful, I love your sewing room! 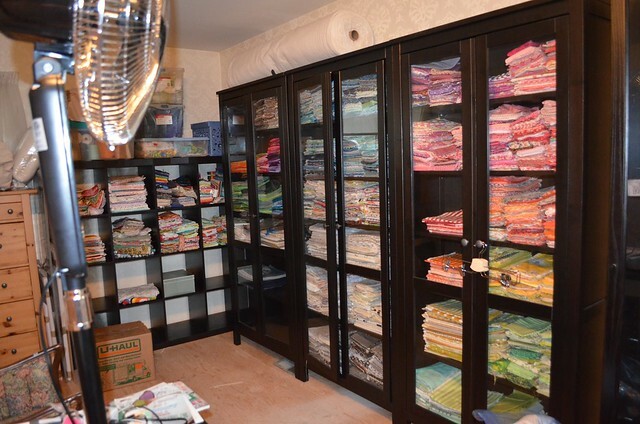 Your sewing room is looking great so far! Love the view! I wish we were having a heat wave here! Brrrr! What a lovely space for creating! It is coming right along considering the heat wave. We are having one here too - so like you I am spending time in the sewing room organizing. Looks like your "kitty is busy rotary cutting" fabric for a new basket liner! As they say Keep Calm and Carry On. It is hard to be patient when the going is so slow in the heat. Can see you have done a lot wow what a great room and such a nice spot for the machine but fear the view could be distracting. It sounds as though it is very hot, wish we could have some of your heat, have had a cool summer here. Here if we want a new flooring they make us empty the room, will not shift furniture, you are very lucky if they will do it with all your things in the room. Happy unpacking you will soon be straight. Good to se the cats have setled in well and I am sure enjoy exploring. Hi Leanne! Congratulations to your new house and your new studio! It looks just perfect! Great size and shape to arrange everything. We moved last August and here it is this time always very hot. That was so exhausting. Then we moved again in December because when we sold our house, we couldn't find anything big enough for us, our work and our dogs. Now I do hope we don't move for a long time. Your garden looks also really nice and it's more fun to clean the dishes and watch your sewing machine! I am incredibly envious of you having a sewing room loo! It's looking like it's going to be a beautiful room already. By the way are you still receiving post at your old address? I may need to update you in my address book! I feel for you having to do this huge job. Love the pics of your space. 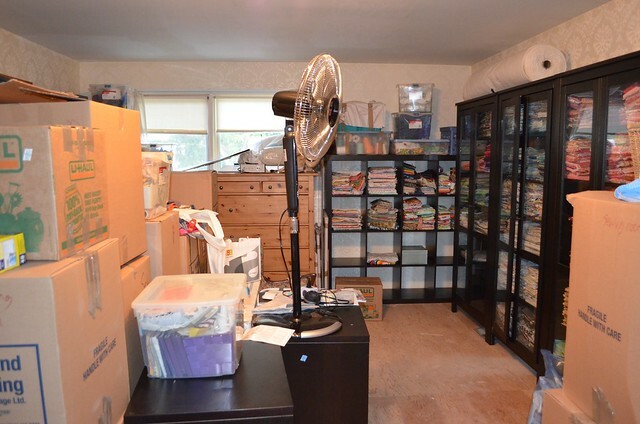 I am wondering what size your sewing/quilting area is? Mine is 24x26 and I need to figure out a better way to arrange it to get better use of my space and yours looked good. I have too much stuff. I also liken my stash to a painter's paint, as I had no other way for people to understand my having a stash, so many people that don't quilt or sew don't understand! So sorry about your heat wave! Never a fun thing. I feel as you do about having sufficient stash--I'm not one of those minimalist quilters but instead prefer a wide palate to draw from, so I do appreciate wh you've got! Mine is a similar size, and like you I have learned to blend in my "special lines" into my rainbow of regular stash. It takes to long to look for the right blue in multiple places. Fun to see your new space! I feel exhasuted by only looking at all those boxes. But.. you clearly are making progress! Your new home looks fabulous and spacey! Take care! How exciting! The room is already looking fab!